It was unofficially dubbed the "No Respect" tour by wedge enthusiasts in the Tyee Triumph Club. As a participant, I can say there was no end of pride as a dozen wedges showed up for a 9 AM run in Auburn WA. Cars ranged from a well appointed '77 Coupe to an '81 PI from the last months of production. Almost half were original TR8s or TR7s converted to V8 power. One TR7 Spider had tallied 180,000 miles and sported a remarkable and easily visible 1/8 inch end play in the thrust bearings! It was ready to run. Another member had converted his left-hand drive TR7 to V8 AND right-hand drive along with full UK spec bumpers. He does remember to stay on the right side of the road! We're not sure what the neighbors thought about 12 sportcars starting up in the street on a quiet Saturday morning. For us it was a symphony. The procession wound its way up a local valley past a salmon hatchery and several wooded lakes toward Black Diamond WA. Long sloping curves gave everyone a chance to take in the sight of nothing but wedges behind and ahead as far as the eye could see. Organizers Larry Ingersoll and Tom Wadell drove the lead and chase cars keeping in touch by CB radio for the sake of any navigationally challenged drivers. At our first rest stop at the Black Diamond Bakery a stray red Miata [MX5/Eunos] happened into the mix. Utterly confused by the surrounding British hoard, she yipped away to a safer parking area. 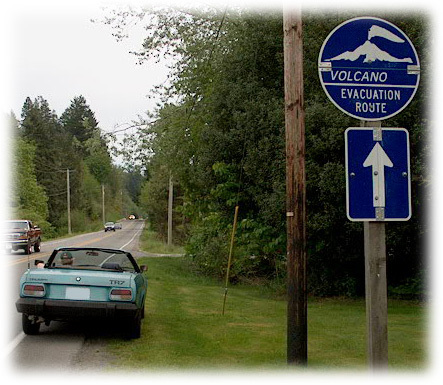 We wound through a series of small towns out of Enumclaw and Buckley, culminating in a curvy stretch of road that doubled as a "Volcano Evacuation Route." It was good to know in the event of a real emergency all those bloated SUVs would never make the curves thus ensuring the survival of nimble cars like the TR7/8. Thank you Mr. Darwin. We gathered at a scenic overlook for the group shot of all the cars. The group shot of the people was fine too but most agreed the cars were much better looking and, for the most part, better preserved. The return leg of the tour brought us to the L&M Firehouse where we all ate the western Washington equivalent of pub-grub -- micro-brews and platters of things entirely deep fried. All in all, we did better mechanically than gastrically. No [serious] breakdowns occurred and though we joked about our Lucas electrics, Ibelieve everyone's turn signals functioned. True, we did put those Federal battering ram bumpers to good use once to push a misfiring spider into a shady spot for some work on the plugs and a few drivers watched the temp gauge as closely as they did theroad. But the day was tremendous and full credit goes to the Tyee club for organizing a great event.